Duke Joseph Forecastle is a level 4 Warlord and the governor of Eagle Keys. He was formerly in direct service to the Side of Seaworld. The city of Forecastle bears his name. He was the only Warlord of the side to lack the Seafarer special and was thus generally viewed as useless and a joke. This perception has only worsened with time, and he is now viewed as a cowardly traitor. Despite not being a seafarer, he was made first mate to the HMS Hubris Unsinkable II, much to Admiral Chequer's irritation. Chequer made it quite clear that Joseph's office was meaningless aside from slowing them down and that he would not tolerate him trying to exercise it in the slightest. Admiral Chequer eventually revealed that Seaworld did this in imitation of Anchorbar. In Seaworld's war with Anchorbar, they have experienced mysterious and sudden losses. And for some odd reason, every single one of Anchorbar's ships has a non-seafarer as first mate or second officer. Seaworld has thus assigned Joseph to this position as an experiment, to see if they can figure out what reason Anchorbar would have for doing this. 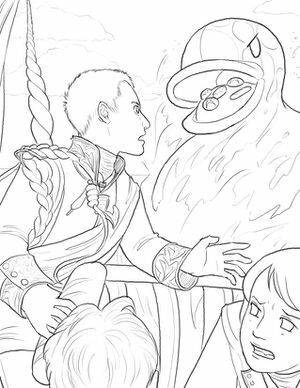 Duke Forecastle finally earned the Admiral's respect thanks to his novel tactics against a sea dwagon. But after he accidentally tamed a double eagle, he quickly earned the loathing of the entire crew, was ordered to spend the rest of the voyage in his quarters, and was punished with Keelhauling. Eventually, the Seaworld fleet encountered Anchorbar's forces at The Battle of the Storm Hex. After Admiral Chequer was croaked by an enemy ship's beam weapon, Duke Forecastle was placed in command. Forecastle proceeded to give the order to grapple and board an enemy ship. Once engaged, he discovered how to use the double eagle's Luckamancy Reserve and spotted his Anchorbar counterpart. With some Luck and cunning, Forecastle captured the warlord and turned the boarding action into a rout, leveling up in the process. With the rest of the fleet sunk, Duke Forecastle saw little point in continuing a hopeless battle and ordered a retreat. He figured out that Anchorbar was beating them by making quakkens friendly to their ships with their non-seafarers. He used his double eagle to capture Anchorbar's non-seafarers, making Anchorbar's quakkens friendly to him, allowing him to win the battle. After the battle, he found an unclaimed capital site and claimed it as a colony for Seaworld, becoming its governor. Due to the double eagle taming incident and retreating from battle, Seaworld's leadership came to loathe him. They rewrote the story to make Admiral Chequer into the hero that saved the side. Duke Forecastle was described as a fool and coward who cursed the fleet with a double eagle, got Admiral Chequer croaked, and retreated only to save his own skin. The only thing that saved Forecastle from court-martial and disbandment was his founding of a colony. Seaworld now uses his name as a pejorative word for the units they use to control quakkens, as well as anyone who is behaving like an idiot. Mocking him while remaining within protocol is seen as sport. The name Forecastle is one of them thar nautical references. However, his name is apparently pronounced as "fore castle" rather than "fawk-sull", which is presumably additional Natural Signamancy referring to how he used to manage the castle at Seaworld's fore. This page was last edited on 6 February 2015, at 05:26.